Le Marche is a rare Italian destination that’s managed to retain its authenticity in an age where every travel track seems well worn. 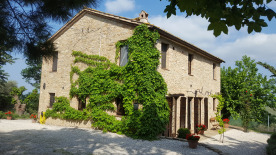 This house sits at its heart and is the true realisation of the Italian dream. Original wooden beams and doors, antique floor tiles, unique frescos and a 17th century fireplace create a charming and stylish ambience. Relax in the dappled shade of the terrace and enjoy the uninterrupted vista over your own vineyard, olive grove, woodland and beautiful wild flower meadow. Although within easy walking distance of the thriving town of Cupramontana, the house is set within a private, peaceful location. The panoramic views from every aspect of the house and garden are spectacular: in the distance the blue Adriatic sea. The swimming pool is enclosed for safety reasons and unoverlooked. It is set within a lovely, lavender scented garden and has a substantial mature garden/ orchard of quince, pomegranate, fig, plum, walnut, apple and cherry trees. You and your friends can enjoy a glass of wine and home-made pizzas from the woodfired pizza oven or you can show your culinary skill at the BBQ. The vineyard and olive trees are looked after by the neighbour, a farmer. You might like to experience taking part in the harvest , a relaxed and pleasurable affair in which friends and family come together. A gift of your own delicious Virgin olive oil is always appreciated by your friends back home. Full independent support can be given during and after purchase by a recommended English/Dutch/French/German /Italian speaking representative.